I nearly crashed the Jeep this morning when I saw this ad on the billboard by Starbucks. The Burchfield Penney Art Center at Buff State is hosting a Marilyn Monroe Exhibit by renowned photographer, Douglas Kirkland. The famous photoshoot, which resulted in some of the most iconic imagery of Marilyn Monroe ever captured, shares with it a story which is as enticing as the photographs themselves… Almost. After renting a Hollywood studio, with no clear idea of what might take place, Kirkland was lead down a path first paved by the wholesome Marilyn then guided by the star. The complete professional at this point in her career, Marilyn established the scene for Kirkland: a single bed with white silk sheets. She understood her audience and what they wanted. On the day of the shoot, she asked all of the assistants to leave and let the photographer and his model work alone. This set the stage for an interpersonal play that makes this work unique. An intimate engagement transpired the interaction of one person and another, the flirting with camera and photographer, communicated the starlet icon to the world. 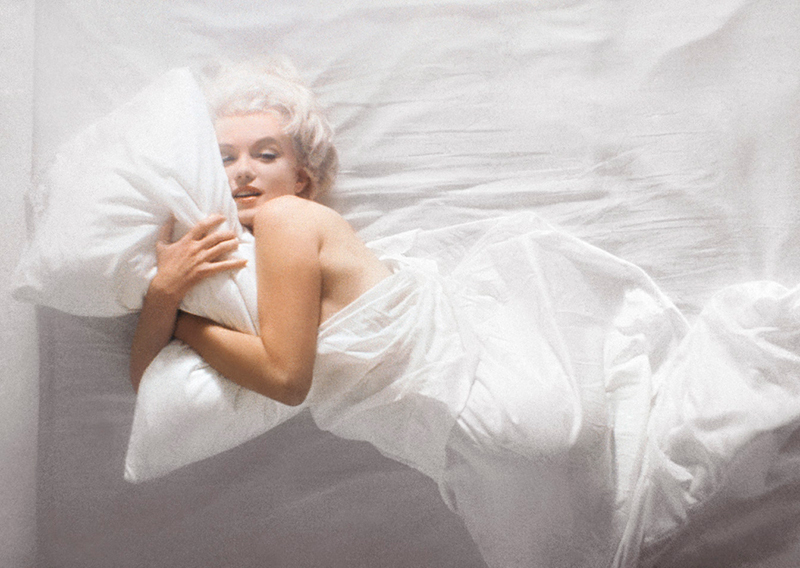 Wrapped in bed sheets and contorting for the viewer, Marilyn appears to reach back through her career and captures the allure that ignited her start. What then was revealed in her expressions and during a post shoot wrap-up was the tortured Marilyn. Unsure and full of doubt – what was apparent were the struggles that the world’s idealized beauty faced though out her career. It was this finally revealed persona – pressured by the expectations of her positions – that later would give context to our post-mortem understanding of the star.